In a small bowl, mix paprika, salt, pepper and powdered garlic. Cut the chicken breasts in 4 pieces, without removing the skin. Butter and season each piece with the condiment mix. Place the chicken pieces in a baking tray and cook to 350 °F for 20 minutes or until the chicken achieves an internal temperature of 170 °F. Remove from the oven and let it rest before serving. Prepare the sauce with a blender or food processor. Add cream, nuts, rose petals, rose oil, honey and salt to taste. When serving, pour a bit of sauce on a plate and place the chicken breast on top. Garnish with an organic rose. To give your chicken breast a golden tone, combine 1 teaspoon of mustard with two teaspoons of honey and spread the mix with a pastry brush on the chicken breasts when they’re cooked halfway through. To keep the chicken breasts from drying, place a tray with water in the lower rack of the oven. This will moisten the chicken while roasting. Use a thermometer to easily check if your chicken is ready. Edible flowers add a special touch to your recipes. 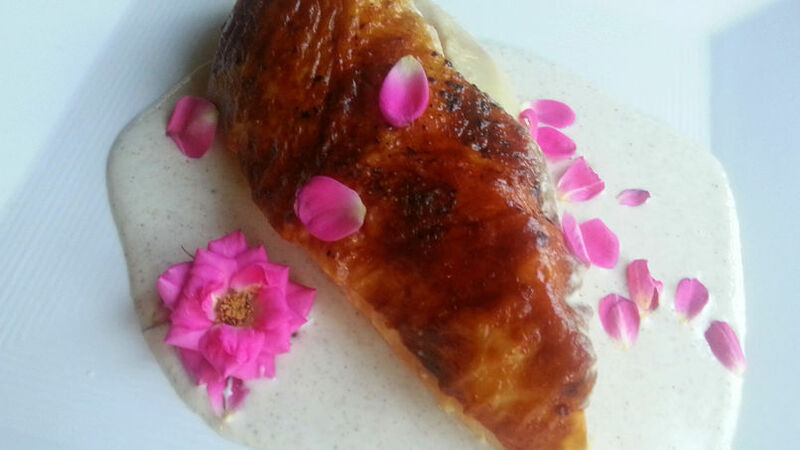 So here’s a romantic meal prepared with roasted chicken breast and rose petal sauce. Let’s get cooking!